In an effort to better understand what makes Packer fans tick in our Packer Neighborhood, I have come up with a list of questions that, in my humble opinion, will tell you everything you’ll ever need to know about the people behind the scenes of the numerous and exceptional Packers’ blogs. These are the folks Robert and I read on a daily basis and you should too if you call yourself a fan. Up next: Jayme Joers, die hard Packer fan, USC Trojan Fan, and Manchester United Supporter, from Random Musings on the World of Sports. In addition to her blog, Jayme is a contributor at BrentFavre.com, and a moderator at CheeseheadTV.com. Jayme crushed these questions much like Alex, Brian, and Aaron before her. It appears the Packers blogosphere is in good hands...as I'm sure you already knew. 1) If you woke up in the middle of the night, and Ted Thompson was standing over your bed watching you sleep, what would you offer him to drink? (that's the polite thing to do) Why? There’s always a glass of water next to my bed. I’m one of those middle of the night water drinkers. But he probably wouldn’t want it as he tends to like new things, not old (veteran) water. Therefore he’d have to settle with some Mad Housewife wine. Its delicious, has a great name and almost always in my fridge. 2) What's your favorite '80s hair band, and how do you relate them to the Packers? (This is relative. you may hate 80's hair bands, but if you had to choose one, who would it be) Does Journey count as a hair band? Cause they’re my favorite 80s band. And as someone who now has a long distance love affair with the packers, I think Faithfully was written for us. If Journey does not count as a hair band, then start counting them! 3) Which cheddar is beddar: mild, medium, or sharp? Subquestion: How the hell does California think they can make cheese? Sharp. Best, best, BEST grilled cheese sandwich is sharp cheddar on sourdough. California – once my home for some years – thinks it can make cheese because it thinks it can do anything regardless or not if it’s true. 4) If John Rambo, in his prime of First Blood Part II, played for the Packers, which position would he play? Is he Pro Bowl material, or just a serviceable player? Does it make me weird if the only Stallone movie I have ever seen is Copland? And let me just say, that I do not think Sheriff Heflin would make the Packers. 5) Ty Webb or Jeffrey Lebowski? That rug really tied the room together. 6) If you woke up tomorrow and the Packers ceased to exist and no one but you remembered them, how would you convince everyone they are the greatest organization in sports? I’m not sure if I’d want to live in that world. Would there be no ice cream or puppy dogs in this world too? Just take away all the good things. Anyways….I’m a very persuasive person. I would travel the land, much like Johnny Appleseed, and tell people of the magical day the Packers held Barry Sanders to negative one yards in a play off game (I’m assuming that the Lions still exist in this world as only good things have been taken away). If that doesn’t convince people then they don’t deserve to exist and I would banish them. 7) Don Hutson basically invented the receiver position, what's your favorite invention: the Cheesehead, the truck-bed tailgate, or the Green Bay Sweep? Tailgate. I don’t eat meat, but is there anything better than drinking outside? And at a sporting event? No. There’s not. 8) Who has better hair, you or Clay Matthews? That’s a tough one. 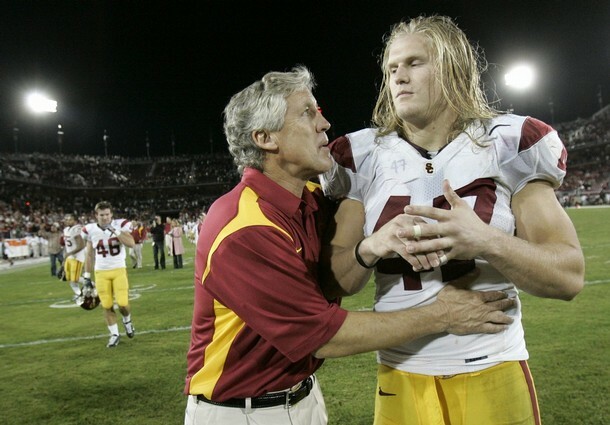 We both have the golden locks that only the sun directly over USC can provide. I’m going to have to go with Clay. He doesn’t seem to get helmet/hat hair. And I do. Side note, while searching for pictures of Clay’s hair, I found an awesome picture, that I attached, cause I think its quite a gem. 9) What do you miss most about Wisconsin, other than the obvious of being able to watch the Packers on TV without ordering Sunday Ticket or going to a bar? (as transplant myself, I actually enjoy the necessity of going to a bar to watch the game on Sunday every now and then) I can’t think of just one thing that I miss the most so here’s my list: 1. Lake Michigan, 2. How drinking at anytime during the day is acceptable. 3. My sister. 4. Cheese Curds. 5. Bob Uecker. Another side note. When I lived in San Francisco, we found this great sports bar called Old Pros in Palo Alto. The Owner/Manager loved the packers and always made sure that I had sound for the Packers games. He also gave me great drink specials and got me Ronnie Lott’s tickets to the SF/GB game that year. I liked that bar. Like I said, I am very persuasive. 10) A rumor was recently brought to our attention on the latest episode of Cheesehead Radio. The rumor insinuates that Robert and I are actually two nerdy teenagers blogging from our parents' basements. While I assure you this is not the case... and both of us do quite well with the ladies, thank you very much, we have data (largely anecdotal, but some quantitative) that indicates that some of our readers could use a little help in this department. What does it take to sweep a highly knowledgeable Packer fan off her feet.... other than raspberry kamis and PBR, of course? One of the most romantic things that ever happened to me: in 06 the Packers were playing the Vikings in a night game. The same night a man I was seeing was flying into Chicago and needed me to pick him up at the airport. It was toward the beginning of our relationship and he was not a big sports fan. We listened to the game on the radio for the drive home and arrived back at my place as GB was driving down field late in the game. Trying not to be a freak, I started to get ready to get out of the car, even though I didn’t think I’d make it up the stairs before the game ended. He put his arm out and said, “let’s wait and see what happens. Don’t want you to miss this.” I melted. Excellent answers, Jayme. And, no it doesn't make you weird that you haven't seen any Sly Stallone movies other than Copland. However, I would suggest taking this long holiday weekend and watching "Rocky 1-6" and "Rambo 1-4"...that should get you up to speed. For extra credit, check out "Over the Top", the 3rd best arm-wrestling movie of all time. The old man said, "Take any rug in the house." So she is a blonde female Packers-Manchester United fan who loves sports so much she blogs about it? I honestly never thought this human being could possibly exist. I am in love! Thanks for the story the Q&A was awesome. -Over the Top not only is the best arm wrestling movie of all time, its the best MOVIE of all time. Great job, although I am concerned about the lack of Stallone in Jayme's movie repertoire. Who can forget the dramatic performance in "Cobra"? Or his career changing preformance in Cliffhanger? While we're on the Stallone subject, let's not forget his work in Tango & Cash. Seriously, is there a better movie from the 80's? Some on here might have an inkling of sarcasm, but that movie on late night TBS is one of my favorite pastimes. Don't forget Daylight either. Jayme, your personality alone makes you a 10, great answers. Wow, Jayme really looks hot in that second photo. Oh, wait. It took me a while to search online, only your site open up the fully details, bookmarked and thanks again.